Cassia has always trusted the Society to make the right choices for her: what to read, what to watch, what to believe. So when Xander's face appears on-screen at her Matching ceremony, Cassia knows he is her ideal mate... until she sees Ky Markham's face flash for an instant before the screen fades to black. The Society tells her it's a glitch, a rare malfunction, and that she should focus on the happy life she's destined to lead with Xander. But Cassia can't stop thinking about Ky, and as they slowly fall in love, Cassia begins to doubt the Society's infallibility and is faced with an impossible choice: between Xander and Ky, between the only life she's known and a path that no one else has dared to follow. 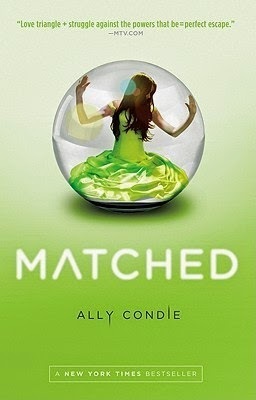 I am not usually one to discuss book covers all that much, but I have to say that I absolutely love the cover for Matched. The shade of green, the iridescent bubble and a brunette in a gorgeous dress of matching green! But the cover is not only to-die for, it's also fairly representative of the reality of our heroine...but I'll get into that in a bit. I definitely went into this book having no idea what to expect. Despite having most of my Goodreads friends give Matched a positive review...well there are some awful reviews about this one. People seem to either love it or hate it and I think the problem is from it being compared to; and even marketed as a Hunger Games-type of book. Matched, being a dystopian which takes place in a 'perfect'/imperfect society (like the Hunger Games) and it also features something of a love-triangle (like the Hunger Games). However, that is where the similarities end. I think people who went in expecting the constant adrenaline rush you get in the Hunger Games were likely the ones most upset about this book. In Matched, we find ourselves in a world where 'The Society' controls everything: where you work, who you love and when you die. In this world, most people seem perfectly content with leaving all of these decisions to 'The Society' because it is a way to be kept safe; to survive. Information is virtually inaccessible; on a need to know basis. You don't ask questions, people don't gossip; everyone just does what they are supposed to. Initially this gives the book an almost Utopian-feel. This world is too good to be true. Then you realize that with everything decided by probability and sorting; there is no creation in this world: no art, no writing, no imagining. They do what The Society tells them, learn what society chooses and obey. Period. Then we have our main protagonist, Cassia. In the beginning, it was hard for me to get a read on her; she seemed so happy to believe everything she was fed by 'The Society'. Being a natural skeptic AND a fan of conspiracy theories, it took me a bit to wrap my head around the fact that Cassia is a product of her environment. She is still young, and when the story begins she never had any reason not to trust 'The Society'. However as the story progressed, I found myself liking Cassia more and more. I found it quite easy to relate to her and it was easy to sympathize with a character opening her eyes after a lifetime of being blind. Her inaction when it was necessary, her thoughts and her instincts all felt very natural and sympathetic to me. As the story progresses she becomes more and more strong, and the skills that were attributed to her early on allow her to gain unique insight into the disconcerting reality of her world. The pacing really sets the tone for Matched. At first it is seems slow, but it really gives you a feel of how life is in this dystopian future. It sets the tone and gives the reader a chance to come to grips with this world and it's realities. The Society seems perfect, but as the story progresses, your sense of creeping dread builds with it. While it's never clear what happened before (to make The Society into what it currently is), it is clear that these people have been living this way very long, and so it takes time for the protagonist to realize things may not be as they appear. The writing style reflects this as well; many things are kept from Cassia (and everyone else) and so as you start reading; many things are kept from the reader. You get introduced to something new, and then get no explanation. It's a bit frustrating for someone like me who ALWAYS wants to know more, but you really get into Cassia's mind-frame this way and it keeps you wanting more. It's a slow burn, that just builds and builds...steady and purposeful. Now let's talk about those boys! I've never been that big on the whole 'love-triangle' thing that is oh-so trendy right now in YA fiction. I usually know which boy I like within minutes and feel the whole 'deciding' thing is a waste of time: make up your mind already! This wasn't like that, even though it was a bit predictable and formulaic I still found myself hooked. Xander is immediately likeable. He's sweet, smart and confident. You can't not like Xander; he's the boy next door: all golden, smiling and strong. Not usually my type, but like I said: you can't not like Xander! *sigh* And then there's Ky. He didn't catch my attention right away; he was a slow burn for me like the book as a whole was. And, the way he talks to Cassia about writing, the things he creates. How their relationship grows with their love of words? That pretty much won me over for where the whole book was concerned. It's such a unique theme, and so very close to my heart personally. I loved how Ally Condie slowly wove poetry, writing and art into the romance, into the character's thoughts and feelings, into their lives; especially since both of those are also controlled by 'The Society'...it made the whole think reminiscent of old romances where so many things are taboo. HUGE plus for me right there and probably worth a full star bump in the rating.